We have a call for papers for a Grand Challenge on Brain-Computer Interfacing at the 14th ACM International Conference on Multimodal Interaction (ICMI). This conference will take place in Santa Monica California (USA). ICMI is the premier international forum for multidisciplinary research on multimodal human-human and human-computer interaction, interfaces, and system development. The conference focuses on theoretical and empirical foundations, component technologies, and combined multimodal processing techniques that define the field of multimodal interaction analysis, interface design, and system development. ICMI 2012 will feature a single-track main conference which includes: keynote speakers, technical full and short papers (including oral and poster presentations), special sessions, demonstrations, exhibits and doctoral spotlight papers. The conference will be followed by workshops. The proceedings of ICMI 2012 will be published by ACM as part of their series of International Conference Proceedings. 1. Inclusion challenge: How can we make an interface profit from user-information from different sensors? How can we include BCI as one of the interaction paradigms in the Multimodal Interaction Framework; how to transfer from “Brains Only” to “Brains Also”. 2. Interpretation challenge: How can we fuse, but also disentangle and interpret information from the user, the task and the environment? 3. Representation challenge: How can we best feed back information to the user? Go for a detailed description and more sub-challenges to our website: http://hmi.ewi.utwente.nl/BCIGrandChallenge2012/ . What can you send in? * Papers on developed systems: please follow the template styles for a long paper described by ICMI. Click here: http://www.acm.org/icmi/2012/index.php?id=authors . * Posters or papers proposing an idea: please follow the template styles for a short paper described by ICMI. Click here: http://www.acm.org/icmi/2012/index.php?id=authors . * Demo: please follow the template styles for a short paper described by ICMI and describe your demo. Click here: http://www.acm.org/icmi/2012/index.php?id=authors . 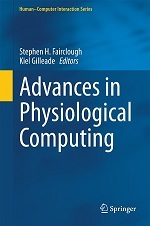 This entry was posted in Events and tagged BCI, conferences, physiological computing on June 14, 2012 by Steve Fairclough.